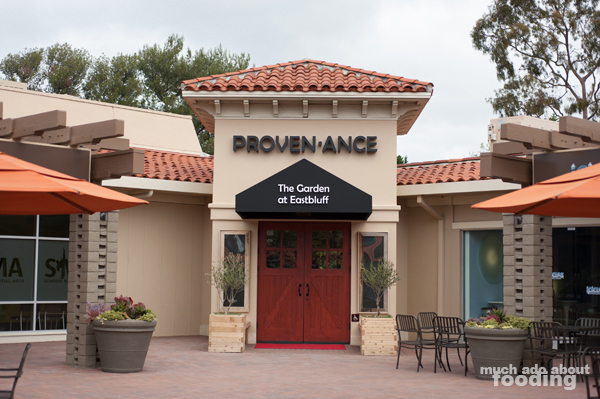 Chef Cathy Pavlos is one of our favorite chefs in Orange County, and our love for LUCCA Cafe easily translated into an excited anticipation about when Provenance opened in Newport Beach. Following it on social media constantly to see the updates and the on-site garden just kept our appetite growing so when we finally made it out to brunch one beautiful day, we were ecstatic. It was beautiful inside and out from the decor to the food. Sundays are the only days for brunch (10AM-3PM) but considering all of the other delicious items on the menu, that's fine by us! The cuisine is Californian, inspired by Napa Valley and the whole wine country experience, and the sourcing is local where possible and humane from the vegetables to the meats and seafood. We went with my little brother and were able to have a variety of tastiness. I knew that it was located in Newport Beach but my familiarity with the area is still hazy beyond the obvious areas of Fashion Island and near UCI. We realized once we found Provenance that it was located somewhere unexpected, just a shopping plaza with a Ralph's and in the corner, nearly hidden. It is very unassuming in the front so I really do hope that people turn this into a destination spot and spread the word because the interior is vastly different from the blanket look of the plaza. It is designed like a wine country farmhouse which felt so homey and comfortable for us when we walked in. An impressive full wall of wine racks lined one end, and we smiled at the old stove as the host stand. 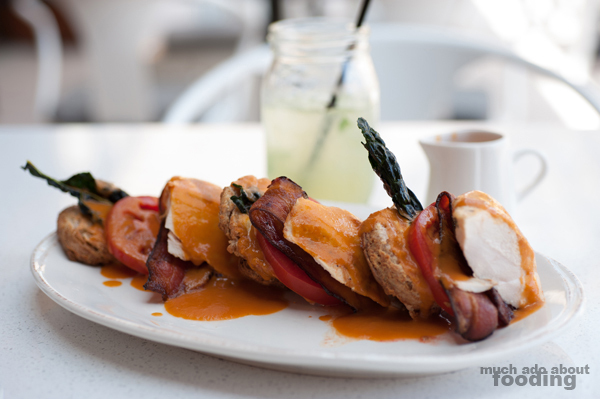 The menu is based on being seasonal and a good portion of the ingredients come from the 1,300 sq. 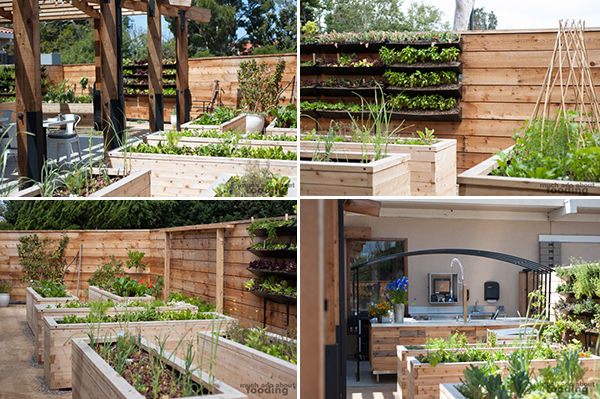 ft. organic raised bed garden on-site which all guests can browse. We were stoked to see such variety and the beauty of the cared-for greens. 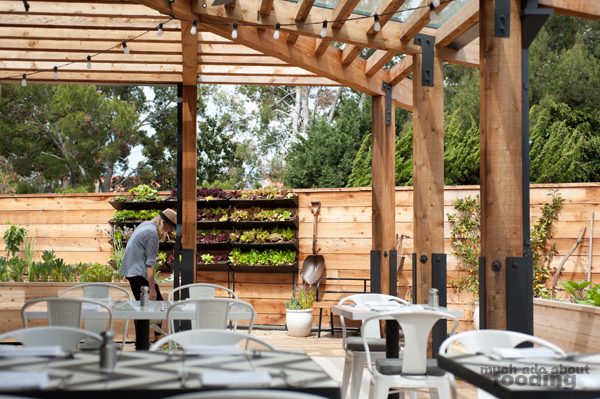 The garden was designed by Native Soils’ Kathy Agresto and the team that had put together other similar concepts such as the one at Montage in Laguna Beach and Park Ave in Stantion (which we've written about before). What the staff gets from the garden also helps drive more than just the food but also the cocktails such as by providing fresh berries and herbs for muddling. Just like at LUCCA, Chef Cathy's dishes are made from components nearly all made in-house from the sauces to dressings to smoking to even preservation. We've always admired her commitment to humanely raised meat so were excited to see how those would turn out that morning. We started with the Scones and Meyer Lemon Curd ($7.50) which were honestly eaten up so quickly that we never got a chance to get a shot in! Flaky, buttery, and rich, the scones were just perfect and even better when paired with the slightly tart, slightly sweet curd. Then we moved on to the drinks. The menu has a section called "'Tails from the Bar Chef" which has cocktails at $12 apiece with Vintage and Signature divisions. There are also microbrews on tap and house infused spirits (some interesting ones I saw were citrus grappa, star anise-vanilla bean whiskey, and red and yellow grapefruit tequila with jalapenos). Since it was early in the morning, we wanted to go for something non-alcoholic so our immediate draw was to their "House Crafted Sodas." 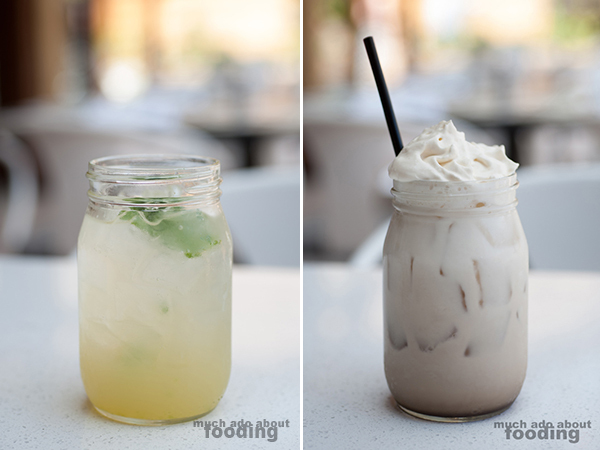 Duc had the Citrus-Honey Ginger Ale with muddled basil ($6) and I the Earl Grey Manhattan Cream Soda ($6). The ginger ale was bright and refreshing with a bare hint of honey. The basil was prominent, and we could only attribute that to its freshness and being grown with care. I really enjoyed the cream soda and was pleasantly surprised when the cream turned out to also be Earl Grey infused. I don't normally eat much cream so was about to set that part aside but an accidental swipe with my finger resulted in my tasting the delicate whip. I then enthusiastically had to have more. My highest recommendation goes for this one - at the very least, try it! In terms of entrees, Duc went for the Jidori Chicken Breast BLT ($15.50 - applewood smoked bacon, biscuits, tomato gravy, crispy black kale with sea salt, and house aioli) because he has an obsession with bacon and biscuits. Luckily he has also become enamored with kale too now that he has started growing his own, and the idea of black kale piqued his interest. This layered dish came out with its own carafe of extra gravy in case you needed more. Why not just swim in it? It's pretty darn good. I do have to say that being sandwiched between the hot and hearty meats caused the biscuits to lose some fluffiness but they were still great. I found the slices of chicken to be tender and slightly sweet from their own juices. The thick bacon made it a strong breakfast-like dish, and the interpretation of "T" as tomato gravy was very creative. Despite all of the other dishes that he tried, this was Duc's favorite. 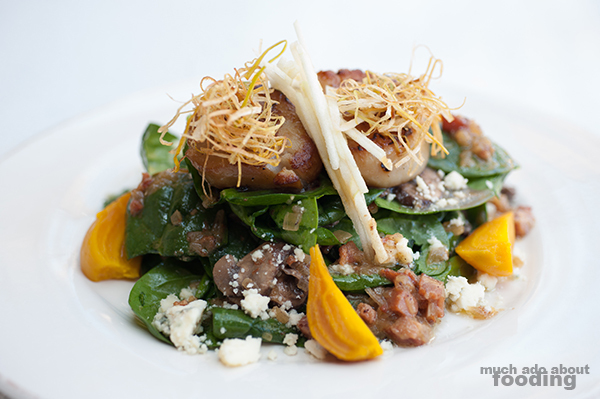 I have always been a fan of Chef Cathy's scallops so I could not pass up on a chance to have her Smoked Hand Harvested Diver Scallops on Wilted Baby Spinach Salad ($19.50 - with beets, apples, wild mushrooms, crispy leeks, Bleu cheese, and warm bacon-pancetta vinaigrette). 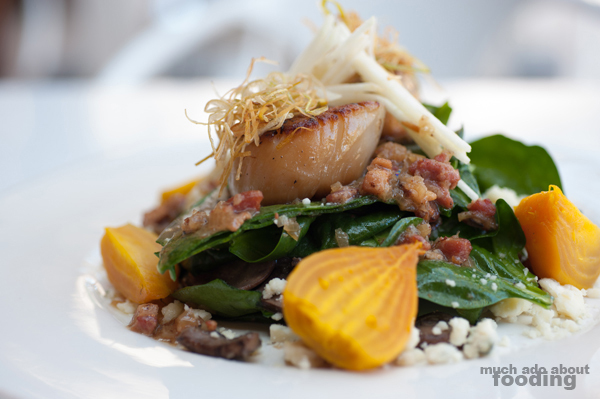 They were very, very smoky scallops which ended up working well with the bacon-pancetta vinaigrette. In some areas, I felt that the dressing drenched more than what it should have but swirling around the greens helped spread everything more evenly. The beets were sweet and firm enough to stand ground against the wilted spinach. I appreciated how the spinach was let to naturally wilt under a warm dressing and texturally, the leeks were a fine touch. As for the scallops themselves, there was just a pair but well-worth the price once you consider how difficult it is to harvest scallops and how large these sea jewels were. Succulent and tender, the scallops outshone the other ingredients by far. 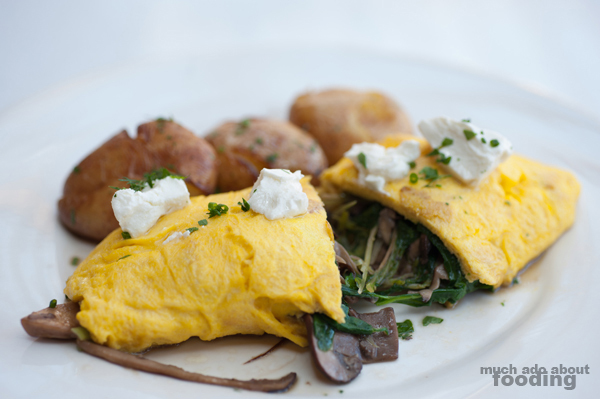 My little brother (okay I call him little but he's 19...still little to me) couldn't decide between two very worthy dishes but ultimately chose the Omelet ($14.50 - with goat cheese, wild mushrooms, baby spinach, leeks, fine herbs, and breakfast potatoes). Considering how close we were growing up and that I took care of him a lot when it came to food, he likes a lot of the same things I do which very strongly includes mushrooms. The omelet does not look like much when it comes out at first (though we did admire how brilliantly perfect the color was) but once sliced apart, it is a bountiful treasure chest of fresh and tasty ingredients. The potatoes had been barely smooshed before roasting, given a unique texture to the starch that you can't get from roasting them whole. Everyone really enjoyed how this dish emphasized the natural flavors of the ingredients themselves and let their herbal, vegetal colors shine. Lastly, there is always dessert to consider. The menu at Provenance does rotate seasonally or for some dishes, even monthly, but the dessert is probably one that rotates more frequently than that. The special part about the dessert menu here is that the ice cream is only able to be found through Provenance, and it is Calvados Ice Cream. These are airy yet creamy scoops that you get. Our first dessert was an ice cream sandwich of sorts but with sorbet and gluten-free cookies for the "buns." 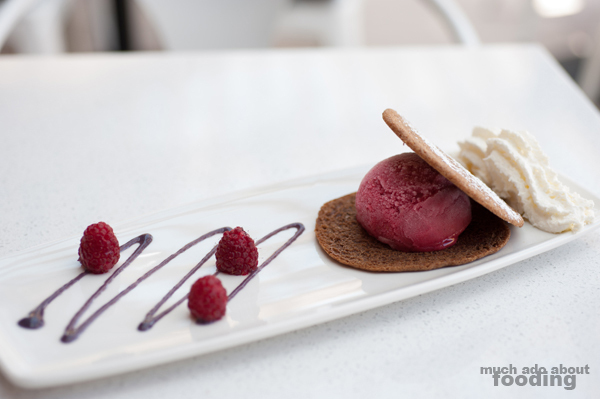 These were made of rice flour and mimicked ginger snaps in my opinion which paired beautifully with a raspberry sorbet. Fresh raspberries finished it off nicely, and we polished the plate immediately. 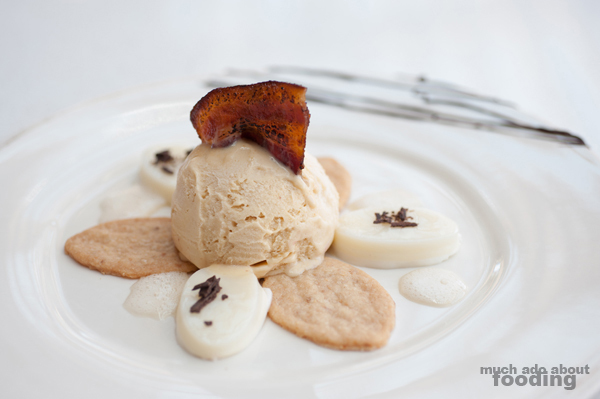 The dessert that we nearly had to pry from Duc's hands was a generous scoop of peanut butter ice cream with goat cheese, sugar cookie crisps and candied bacon accentuated with shaved chocolate. I wish I could give you the names for both of these but Chef Cathy was so gracious to treat us to these without us knowing about it beforehand. Luscious and creamy, the ice cream still had the peanut butter saltiness that bacon complements well, and the goat cheese was a good cleanser. It was a beautiful close to a highly enjoyable brunch, and we plan on coming back soon again with more people! Cheers to Chef Cathy for executing another fantastic restaurant, and congratulations for its opening. We look forward to many, many more visits.